I woke up this morning and it was 21 degrees out. I decided to wait a bit to get out on the water. I wanted the dept to get up near freezing. When I got to the 18 the parking lot was completely full. I decided to head west to do some scouting for what will turn out to be a day on the water with Commander Tom. I fish the lower end of a trib in some green water and hooked into 2 skippers on eggs that wiggled their way free near shore. I then decided to stop at a few other locations and ran into Dave. Dave is a nice guy to talk to as was his fishing partner. 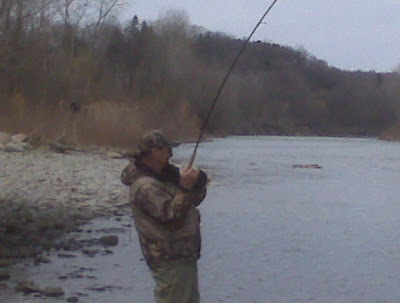 I took the picture of Dave doing battle with a steelie. He said he got a few here or there and when we were done talking I decided to take a few drifts. My worn out line which has been on the spool since October and has been through the wars was giving me some difficulties. I decided to call it a day after about 3 1/2 hours and to a run to a few tackle shops to stock up on some goodies . While I stopped into Gander I made it a priority to pick up 330 yards of Sufix Elite in 8lb and rid my reel of the old crap which has seen better days. Right on Joe...Go get them tomorrow. Man...You are a fishing machiene.